Hines Ireland has today welcomed Dún Laoghaire-Rathdown County Council’s decision to grant planning permission for the development of a major new road network at Cherrywood, marking the next important phase of development for a new Town Centre and 4,000 new homes within Hines’ landholding at Cherrywood in South Dublin. Construction work is to get underway in the coming weeks on the multi-million euro project which will see the development of 5.4km of roads, footpaths and cycle ways at Cherrywood. It is expected that the roads will be completed by the end of 2017. Planning permission has been granted by Dún Laoghaire-Rathdown County Council under the fast track Strategic Development Zone (SDZ). The roads will form part of the public road network providing access and services for the development of Cherrywood and the adjoining areas. When completed the road network will serve the expected population of 30,000 residents who will eventually live in the 8,000 homes that will be constructed across the entire SDZ and work in the new town of Cherrywood. Out of this, the Hines’ lands will accommodate 4,000 homes with a population of approximately 15,000. This announcement follows the recent granting of planning permission for the development of two major parks at Cherrywood equivalent in size to Dublin’s St Stephen’s Green and Merrion Square. Hines has also recently lodged a planning application for the development of Ticknick Park which is 47 acres. 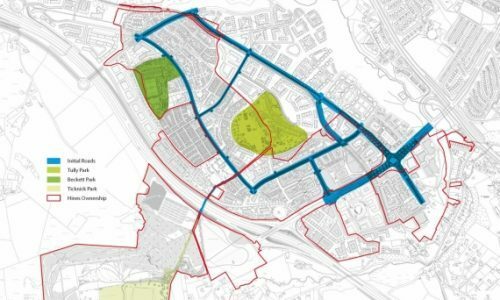 “We are delighted that planning permission has been granted for the development of this road and infrastructure network to help expedite the delivery of Cherrywood. This approval follows the recent granting of permission for two major parks at Cherrywood and signals real momentum for the project. This road network, in addition to the excellent public transport infrastructure, including four LUAS stations and direct links to the country’s motorways, will further enhance Cherrywood as an unrivalled location for families to live in and for businesses to grow. We will break ground on this phase of development in the coming weeks, and in doing so it will raise the flag on what is set to become one of the largest construction projects in the state. Hines is focused on rolling out the Cherrywood project as quickly as possible to deliver a new town for South Dublin which when completed will be home to 30,000 people. We look forward to our submission of planning in the autumn for the new Cherrywood Town Centre”. The upfront development of Cherrywood’s roads, pavement and cycleway infrastructure as well as its large amenity zones, underpins the commitment to expedite the delivery of the 4,000 homes contained within the Hines land holdings. A detailed planning application for the new Cherrywood Town Centre, including a major retail centre, cinema, other leisure uses, restaurants and apartments will be submitted later this year. The 400 acre Cherrywood site was acquired in November 2014 with Strategic Development Zone approval for the construction of a new retail-led mixed use town centre with 4,000 apartments and houses within Hines’ landholding; and zoning capacity to upgrade the second largest office park in Dublin.